A first-of-its-kind paper on private school vouchers in Milwaukee, Wisconsin, looks beyond student test scores and focuses on the impact the school choice vehicle has on crime reduction. “We took a representative sample of participants in the [Milwaukee Parental Choice Program] and carefully matched them to similar Milwaukee public school students and then tracked their outcomes over time,” Patrick Wolf, professor at the University of Arkansas’ Department of Education Reform, told The Daily Signal in an interview about the new paper. Wolf and Corey DeAngelis, an education policy analyst with Cato Institute, evaluated the Milwaukee Parental Choice Program, first launched in 1990. It is commonly referred to as the nation’s first modern school choice program, providing vouchers to Milwaukee’s low-income students for use in private schools. The test score analysis, which began in 2007 and ended in 2012, found the program had positive effects on students’ reading scores, but little impact on math. However, in the the latest analysis titled “Private School Choice and Character: More Evidence from Milwaukee,” the evidence is clear: School choice alleviates young adult crime. In this paper, Wolf and DeAngelis evaluated non-test score impacts of school choice such as student character. According to the paper, students who took advantage of the school choice option committed fewer crimes than counterparts in public schools. As young adults, these students committed about 53 percent fewer drug crimes and 86 percent fewer property crimes. The results also show 38 percent fewer paternity suits filed once students reach their mid-20s. These suits occur when there is difficulty identifying a child’s biological father so child support can be properly paid. Since Wisconsin is the only state in the U.S. that publishes every citizen’s record of criminal charges and convictions in a database searchable by the public, the report’s research team was able to easily cross-reference its voucher student information with the state’s criminal records database. In the mid-2000s, Wolf said, policymakers were conflicted about changes to be made to the voucher program, which had not been analyzed since 1995. 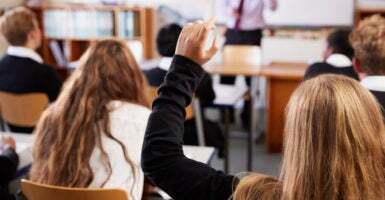 When Wolf and DeAngelis pitched to the legislators their idea to study the program in 2007, supporters and skeptics agreed on a new regulation that lifted the enrollment cap so more students could be evaluated. So it was lawmakers’ reaching across the aisle that later would reveal the hidden gem of school choice’s benefits in preventing crime among young adults.